Memphis sits atop a special underground water source – the world-famous Memphis aquifer. Sometimes it’s called the Memphis Sand Aquifer, but “Memphis Sand” is the name of the geologic formation… “Memphis aquifer” is the hydrologic formation. And if you’re in Mississippi, it’s called the Sparta aquifer. Scientists sure like to make it easy to understand! 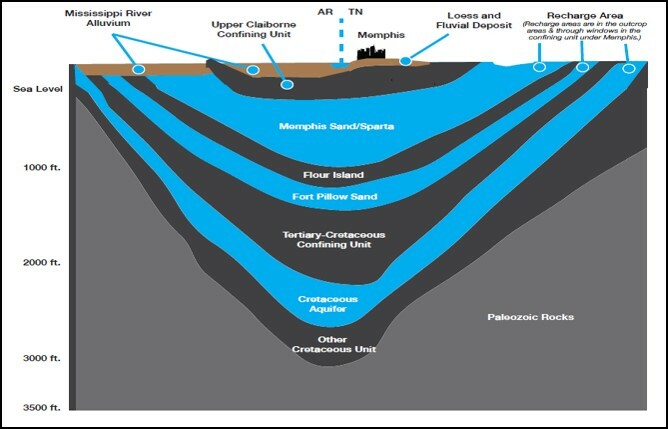 You’ve probably seen that the Memphis aquifer has been in the news a lot lately – coal ash pits, clay layers, arsenic, ahhh! There’s a lot of information out there and we all want to sound smart at parties. These four facts will help you be in the know when it comes to our famous water source. Most of our drinking water comes from the Memphis aquifer and the water directly below Cooper-Young is 2,000 years old. It was thought to be protected from any major surface pollution by the clay layer above it. Over the past 20 years, natural gaps or “breaches” have been discovered that allow surface water and pollution to sink into the deeper Memphis aquifer. These natural gaps are a thinning or absence of clay from old erosional scars (think ancient rivers), or faulting. The good thing about the natural sand aquifer is that water travels through it very slowly. The concerns of contamination and pollution are really from historical pollution. For example, the Tennessee Valley Authority coal ash pit that has been in the news, was constructed in the 1950’s, before the EPA’s formation or any type of regulations. Most major pollution is coming from industrial activity pre-1970. It’s taken over 60 years in many cases for pollution to seep into the ground and travel towards production wells. Unfortunately, very little is known about exactly where the breaches are and how fast water and pollution can travel through them into our drinking water source. The Center for Applied Earth Science and Engineering Research (CAESER) at the University of Memphis was awarded $1 million a year from Memphis Light, Gas and Water (MLGW) to study the clay breaches in the Memphis aquifer and their impacts to water quality. A study of this scale has never been conducted on the Memphis aquifer. The goals will help MLGW determine a water pumping regime and well placements that minimize water quality degradation and make sure the water you are drinking, bathing in, and cooking with remains one of the highest quality sources in the United States. Funding for this research is citizen-driven, through the collection of 1.05% of MLGW water bills. CAESER will host two public forums per year to update the community on the research progress and findings. The first of these meetings will be held Monday, April 8, 2019 from 6:30 – 8:00 p.m. at the Benjamin L. Hooks Central Library, 3030 Poplar Ave., Memphis, Tennessee 38111. You can find more information and RSVP to the event here. It is crucial for the residents of Memphis and Shelby County to understand what the research discovers so you can influence smart planning to ensure a clean water source far into the future. Overall, the Memphis aquifer is still one of the highest-quality drinking water sources in the United States and WORLD. We need to understand more about the major threats and physical characteristics of the aquifer system to keep the jewel of Memphis, Tennessee clean and pure.